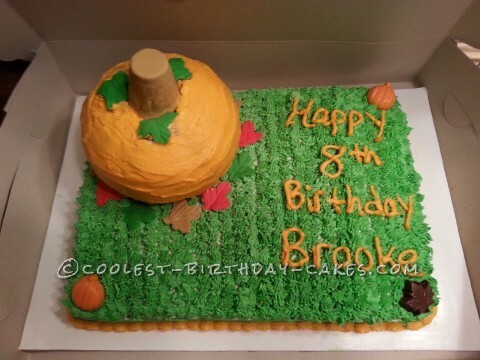 I had a fall/pumpkin theme cake for my daughter’s 8th birthday! I made a half sheet and used the tip that pipes icing to look like grass. I covered the half sheet with butter cream icing tinted green for the grass. The small pumpkin on top was made with a 3D pumpkin pan. I tinted butter cream icing orange for the pumpkin. The stem is an ice cream cone covered in brown fondant. The leaves around the cake are also fondant cut out from leaf cookie cutters. The pumpkins in the corner are made from candy molds.